In this hands-on workshop, we'll talk about the basics of advance care planning - what it is, why it's important to think about our health care preferences BEFORE it matters, who we should talk to and how to talk about these issues. 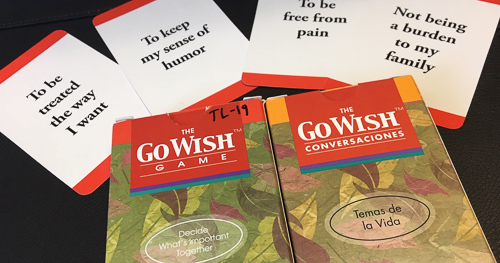 Each participant will use Go Wish cards to prioritize what's most important to them if they were to face a serious illness. We'll go through the Five Wishes advance directive form, how to choose a health care proxy who can advocate for us, and what sorts of things we need to discuss with our loved ones before we experience an illness. After the workshop participants will be able to schedule free consultations with legal advisors who will support them in completing forms discussed in this workshop. SAGE is sponsoring this important workshop presented by Transitions LifeCare. Please put it on your calendar and plan to attend. The topic of this workshop is important for SAGE members, our family members, caregivers, friends and associates. All are welcome. You do not need to be a SAGE member to attend. We are requesting a free will contribution of $5 for each workshop. Refreshments provided.